The Horizon View Portal page for the connection server has changed throughout the different versions. This article describes how to modify the behavior of the portal for version 5.x or 6.x when you have installed the HTML Access feature. When you don't have that additional feature installed then you have the 'default' portal. 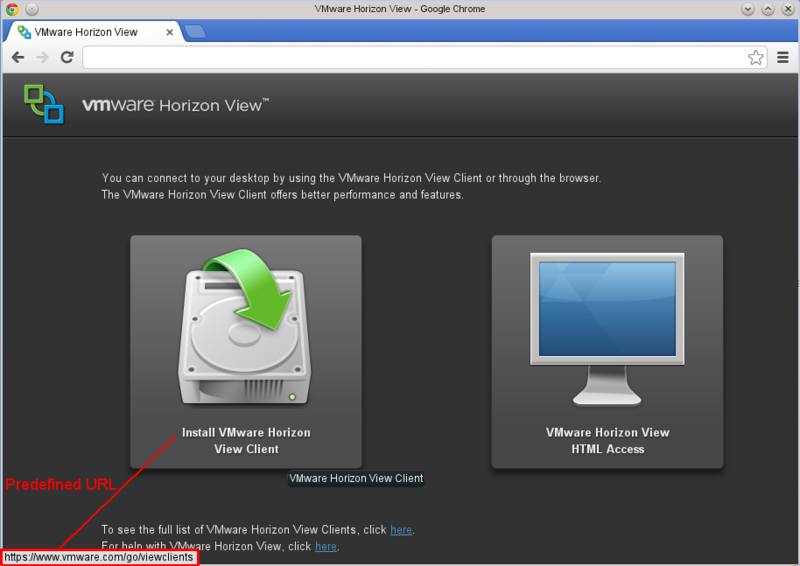 How to modify the text and download links for the regular portal is described in this document: Using VMware Horizon View Client for Windows. For version 6.x: This can be done by modifying a file named portal-links-html-access.properties. It can be found on you connection server in this directory: CommonAppDataFolder\VMware\VDM\portal\ (C:\ProgramData\VMware\VDM\portal). A last note on all of this: if you upgrade to a new version of Horizon View there is a fair chance that this will be overwritten. So make sure to create a backup of these modified files and check what happens during the upgrade before you upgrade your production environment.